Ok 2 model runs in and it looks fairly certain we will see another deep cutoff low transverse the country, this time with better moisture support for coastal areas. While the Low combo will bring severe heat to QLD, it’ll bring cold rainy conditions from the South to Mid North coasts, with potentially heavy falls (~100mm) possible in some locations. This low is looking like a Kiwi express, should be short and sweet on current predictions. Both Access and GFS have ramped up rainfall totals for this event, with a 100 mm bullseye near or over Sydney and the Illawarra. I will be expecting an upwards adjustment of expected rainfall in this afternoon's forecast. The ECL moves away by Friday after which it looks like a cool, unsettled start to Summer. GFS (but not Access) shows a brief burst of heat on the weekend. Access has a trough in the NE if the state which spins off another ECL off the North Coast of NSW early next week. Right now, it's a bright sunny morning, with bits of cloud moving up from the South. There's a cloud bank off the coast circulating about the low in the Tasman which might move over us later. Further to my previous post, EC and TWC are broadly consistent with Access and GFS for some big rainfall totals on Wednesday, focussing near Sydney. Yes, there will be big falls somewhere on the NSW coast for sure Steve777. I'm wondering if it will be one of those intense convergence lines that develop over the Illawarra and slowly track north delivering biblical rainfall rates. WOW! they must be expecting some huge totals. 14:50 Nov 26 NSW Flood Watch: Central Coast to Illawarra Coast. NSW Flood Watch: Central Coast to Illawarra Coast. Minor to Moderate flooding is possible along the Hawkesbury and Nepean River and Georges River from Wednesday. Sydney Metropolitan areas and coastal catchments between Central Coast and Illawarra Coast may see widespread localised flooding and minor to moderate riverine flooding. 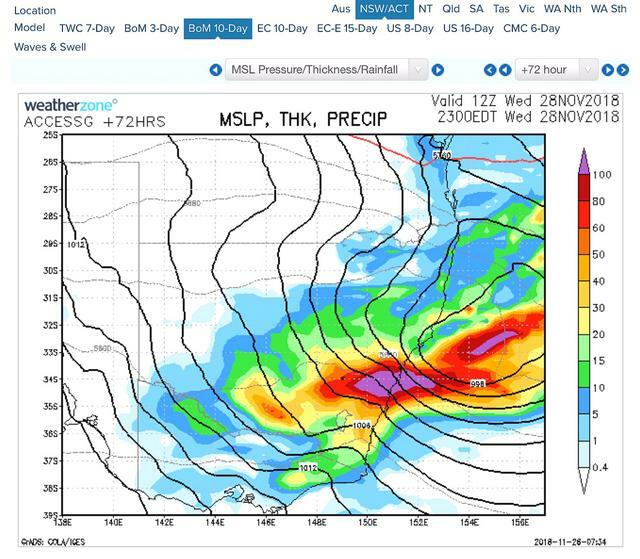 A low pressure system and associated front is expected to move into central New South Wales during Tuesday, and then deepen near to the coast on Wednesday, bringing widespread rainfall between Central Coast and Illawarra Coast.. The weather system is expected to bring intense rainfall and has the potential to cause local overland flooding as well as minor to moderate riverine flooding from Wednesday. And bom couldnt wait til 420pm to update forecast. 50-120mm. They just turned on the hapless desal plant today as well aparantly! So not just a coastal event. Very happy to see Goulburn included as it’s dead brown there and desperately in need of some good solid falls. Not sure I've ever seen them issue a SWW so early for an impending event, must be expecting something epic! Possible we might make up our yearly rainfall deficit in one event? just a straight 'heavy rain' forecast in the Illawarra. They must be confident. Weather Situation: A low pressure system over central parts of Australia is moving east. This system is expected to enter the northwest of New South Wales on Tuesday and then track southeast, rapidly intensifying as it crosses the coast about the Greater Sydney area during Wednesday. Intense rainfall and vigorous winds are expected to impact parts of the Illawarra and Greater Sydney area on Wednesday before the low quickly moves east away from the New South Wales coast. HEAVY RAIN which may lead to FLASH FLOODING is likely for some parts of the Illawarra, Sydney Metropolitan and Blue Mountains during Wednesday. The most intense rainfall is likely to be during Wednesday morning and afternoon. DAMAGING WINDS, averaging 60 to 70 km/h with peak gusts in excess of 90 km/h are likely along the coastal Illawarra and Sydney fringe from late Wednesday morning, and extending to the Central Coast and the Hunter coastal fringe during Wednesday evening. Winds are expected to ease later Thursday as the low moves further away from the coast. Locations which may be affected include Newcastle, Sydney, Wollongong, Nowra, Bowral and Katoomba. We’d need 500mm here but 150mm is a great start. Still 300mm behind last year which wasn’t flash. Looks like I'll be getting smashed with 100-150mm. That is a very lofty 50% chance threshold. How would this compare to the 2016 Ecl. Ouch, 500mm is quite a deficit. Should still make a considerable dent. Yeah the earliest SWW I've seen is about half a day before an event. Not 2 days before. Looks like the BoM are very confident with this one. Wasn't the June 2007 ECL SWW issued about 3-4 days beforehand? I remember the press release being released super early, maybe 4-5 days before the pasha bulker ECL hit. Let's hope they are right, otherwise it may be another Chicken Little episode. Have 'they' really test fired the Sydney desal' plant? If it buckets down maybe that is all it takes to get some decent rain around here. Yeah i would have been 8 years old for that event haha. I wouldn't mind another June 2007 ECL event, it was the only time it filled all our dams within a day. We only need 10 inches in a day, but make it over two days instead, the ground needs to soak some up first. 8 registered (Adaminaby Angler, sebbie78, wet sky, bbowen, Knot, scott12, samboz, 1 invisible), 61 Guests and 2 Spiders online.